On Monday, domestic worker leaders from across the state brought our power, our voice, and our unity to Sacramento. In a political moment in which low-wage immigrant communities face attacks across the country, domestic workers from Los Angeles to the Bay Area gathered in the Capitol to collectively raise their voices to assert their rights and defend their dignity. Domestic worker leaders shared stories and testimonies to advance the California Domestic Workers Coalition’s #DefendDignity 2017 Legislative Platform which endorses priority state legislation that directly impacts domestic workers as women, as workers, as mothers, and as immigrants. 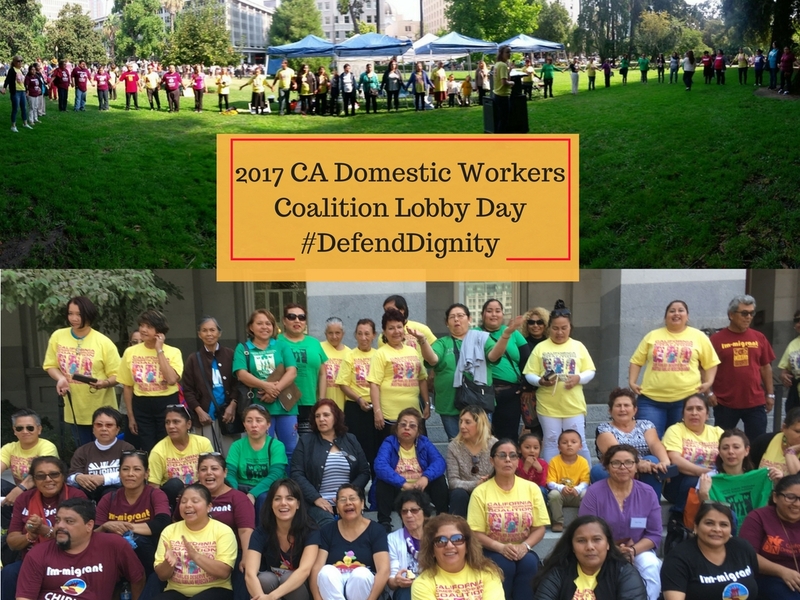 Our #DefendDignity Lobby Day focused on lifting up two priority bills for California’s domestic workers: SB258 The Cleaning Product Right to Know Act and SB54 The California Values Act. To see the full 2017 legislative platform, click here. Lobby teams of domestic workers met with members of the California Assembly to urge them to vote in support of SB258 (Lara): The Cleaning Product Right to Know Act. SB258 would require cleaning product manufacturers that produce both household and commercial cleaning products to disclose the list of chemical ingredients on its packaging and online. Domestic workers experience disproportionate exposure to the toxic chemicals found in typical household cleaning products, an experience that is compounded by ongoing exclusion from protections under OSHA and other health and safety laws. Domestic worker leaders shared powerful testimony about the impacts of working with toxic cleaning products for prolonged periods of time and how they have suffered from respiratory illness, skin rashes, and fear for long term health problems as severe as cancer. Domestic workers are entitled to know the ingredients and health risks associated with the products they use to do their work each day. SB 258 is crucial for those who clean homes to advocate for their own health and to protect the health of millions of families and households that depend on them. The heightened fear of deportation and family separation is damaging to the fabric of the immigrant community, disproportionately impacting domestic workers who are majority immigrant women and serve as primary breadwinners for their families. The current climate of escalated immigration enforcement compromises the ability of domestic workers to feel confident and empowered in exercising their rights to basic labor rights such as minimum wage and overtime protections. Moreover, the entanglement of local law enforcement agencies and immigration enforcement also has a tremendous cost to public safety. Immigrants, especially immigrant women, often fear approaching police when they are victims of and witnesses to crimes including domestic violence and other forms of violence against women and children. The message in the Capitol rang clear: In California, domestic workers are uniting to defend themselves and their families from policies that criminalize immigrants and from the threat of ongoing mass deportations and separation of families. 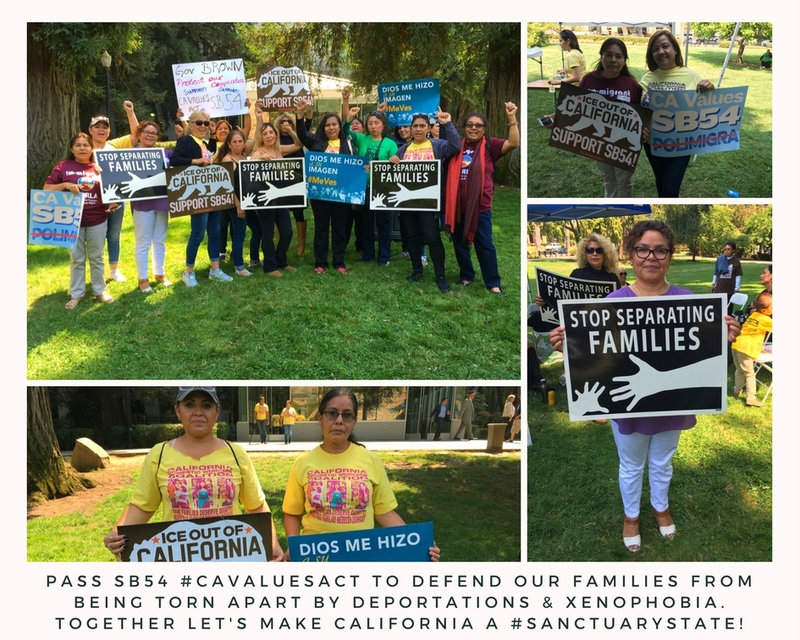 SB54 (De Leon), The California Values Act, would ensure that state and local law enforcement agencies, school police, and security departments do not engage with nor provide resources to support immigration enforcement processes.